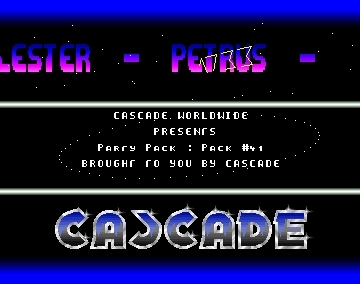 This section lists Cascade intros, that were not releases by itself, but linked infront of other releases, e.g. 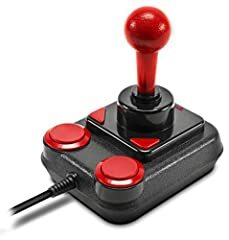 a cracked game. 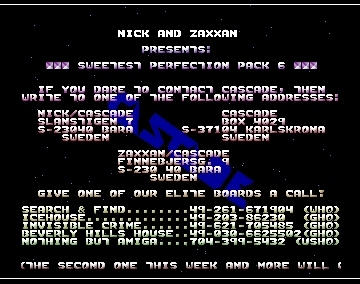 Intro used in "Sweetest Perfection Pack" (5 and 6), which were released when Nick left Warfalcons and joined up Cascade taking with him this packdisk series... 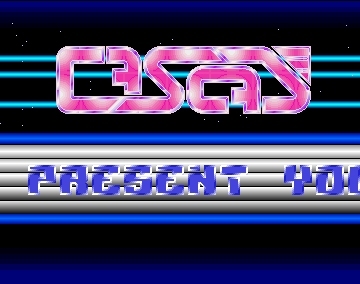 The according Packdisks can be downloaded separately here. Intro for the Party Pack, that was released at the Red Sector Party Alpha Flight, Spectral Party April 1990. 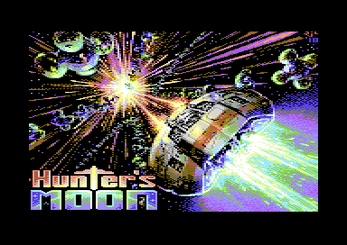 The same intro was also used in other releases, like e.g. 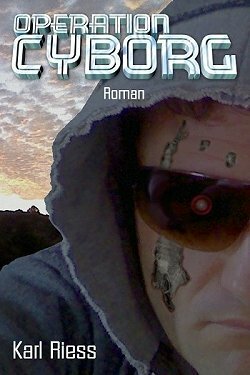 "Typer V1.0". 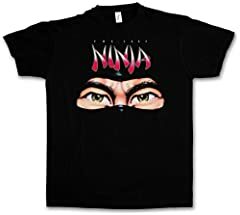 Music was presumably made by Bruce, though this is not certified. 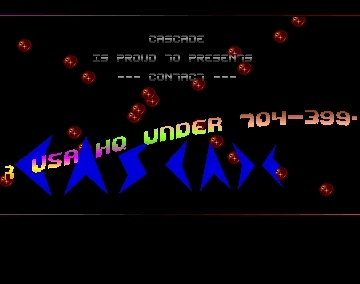 Cute little crack intro by Don & Zorro, promoting the Casacde Boards. Text written by Don. 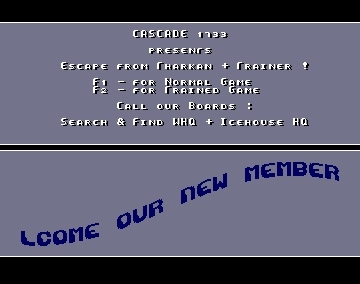 This nice intro was used (in minor variations) as cracktro for the Game 'Escape from Tharkan' and some collection package with the number 42. The .zip file offered for download includes both variations, so you have to repack the file, before mounting into WinUAE. 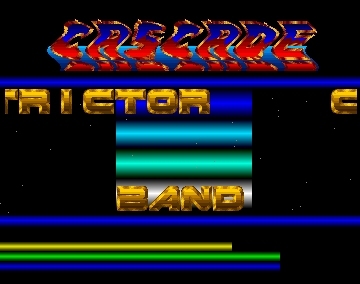 Little Cracktro presumably done by Bruce and Bongo. 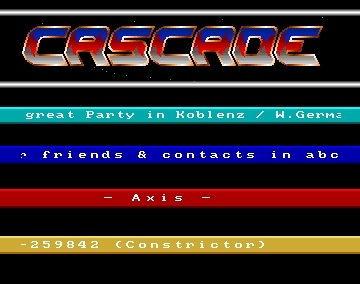 Scrolltext announces new members joining Cascade Germany, namely Don and Zorro. 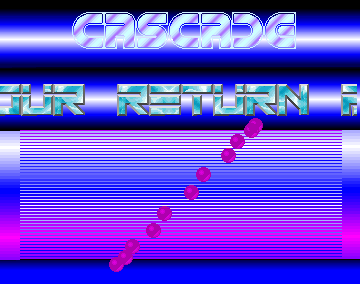 Crack/Import intro done by "Touchdown" as a subgroup of Cascade. Music by Ghetto/Alpha Flight. Pack/Collection intro. Music by SLL/Jewels. 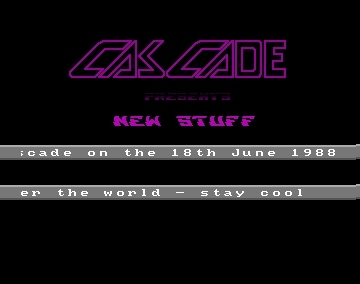 This unnamed Intro was presumably made in 1989 and most likely used as intro on a cascade packdisk (at least this is, what the scroller suggests). It was also used for cracks (e.g. Haunted Mission Pre-Release). Music in this intro was made by an unknown. 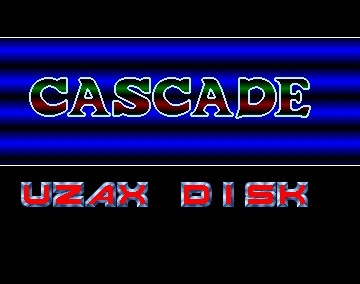 Intro for an utility disc with the name mentioned above. Music is made by an unknown musician. 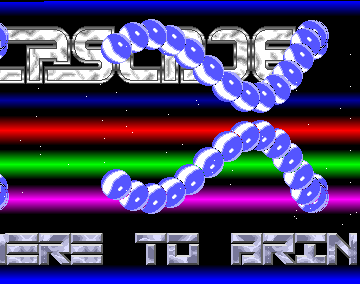 Logo was presumably made by Skatemaster. This "still-alive-tro" was probably made in 1989 and presumably used as intro for a packdisk. Music was made by The Judge. 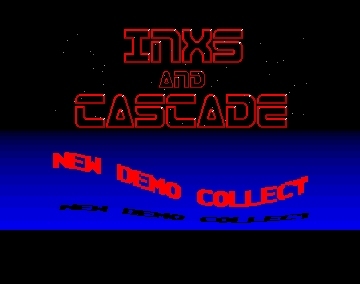 Little sweet intro/demo released on the Compact Disk number 18. 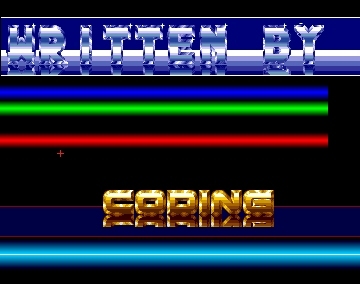 Nice, little intro made by Crackline, presumably for being used as crack or packdisk intro. 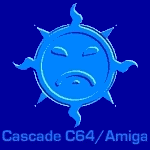 At least it was used in Cascade's Mega Demo 1 (aka Fanatic). Music by Walkman/Byterapers. 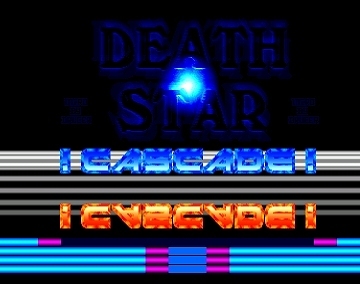 Well, this intro here might not really be a Cascade release itself, as it was coded by Drucer/Deathstar (Music by Sky/The Enemies, Graphics by an Unknown) but this intro was (obviously)used for part 3 of the packdisk series called "Deadly Mix", which was released by both Cascade and Deathstar. 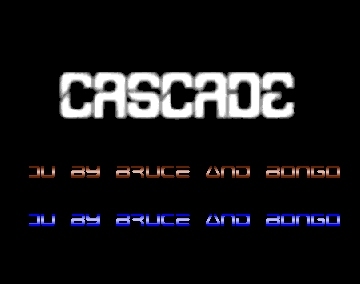 Little intro made by Bruce and Bongo for their Packdisk series. The according Packdisk number 16 is not available yet. 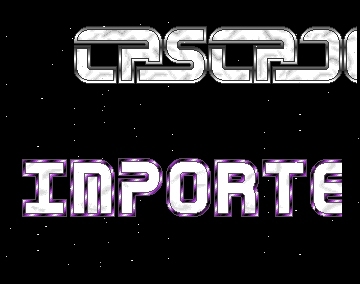 Little intro done for stuff that was supposed to be spread in Venlo. Small intro used for a music disk or similar. Would be nice to have the complete release. 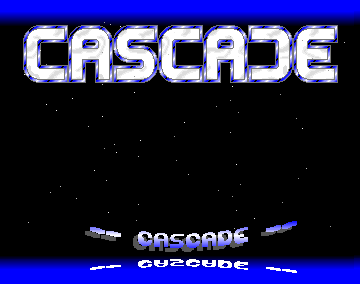 It's a very early sign of life from Cascade on Amiga. Music was made by SLL/Jewels. 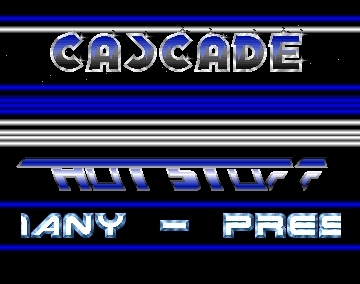 Intro for a musicdisc/music collection. The according production is leisted here.